Here is an article about homeschool History by Jason Rodriguez called "Homeschooling History - Is it Part of Your Curriculum?". I added my comments at the bottom of the page. In a quick survey of state requirements for homeschools, none required history be taught specifically. However, most states require social studies and history is part of social studies. In addition, history is required specifically to satisfy most college entry prerequisites. 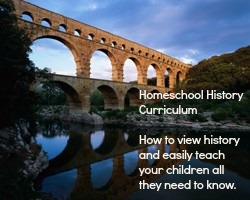 Is history part of your homeschool curriculum? A lot of parents and students shy away from history because of traditional notions of boredom, memorization, and irrelevancy. Movies and television programs oftentimes portray history being taught by dull instructors who dwell on obscure topics while students sleep or engage in other distractions. No wonder then that some parents fail to homeschool history. However, history is too important to ignore. The ability of your child to enter the college of his/her choice will be affected by a lack of preparation in history. It would be an embarrassing situation indeed if your child excelled in your homeschool and then had to take remedial history to satisfy college entrance requirements. Parents who break out in hives at the mere mention of the word history should explore some of the innovative products and textbooks on the market today directed at making history interesting and exciting for homeschooling history. One of those products is homeschool unit studies which enables parents to formulate lessons in history around the interests of their students. For instance, suppose a student likes music, especially rock music. Parents can convert that interest into lessons in history by tracing the history of rock music in the USA and its relationship to protest movements and individual rebellion and attempts at constructing identities. Such an approach could make use of videotapes, movies, perhaps even a trip to the Rock and Roll Hall of Fame and/or a local Hard Rock Cafe. Whatever other interests your students have can be similarly explored. Homeschooling history should be a critical part of your homeschooling curriculum. You should explore the many resources available which make history fun to teach and exciting to learn. If you would like more information about college and the homeschooling history [http://homeschoolingbasics.info/homeschooling-history] as well as general information on homeschooling, please visit [http://homeschoolingbasics.info] These links don't work but I am required to list them here. I have to agree that homeschool History doesn't need to make a parent break out in a cold sweat. I don't remember liking History when I was in school, but now as a homeschool Mom, it is one of my favorite subjects. I love the way I can make our homeschool History program interesting for all of us. We read aloud a lot together and enjoy learning about what has happened around the world over the course of time. You can use Sonlight if you like a literature approach, Abeka if you like a textbook approach, Switched on Schoolhouse if you want to use the computer, unit studies if you like to create your own activities, or any host of other History programs. 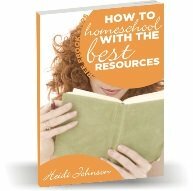 If you are just starting out with homeschooling, I suggest that you focus on Reading, Writing and Math first when you are trying to decide what books to buy. After you have those in place, then you can start adding in the other subjects one at a time.